Adds a standard 9-pin Serial COM port to a desktop or laptop computer that has a standard USB port. This device is used to adapte your USB connection to our LED Signs through our standard RS-232 Serial Cable. Software drivers are provided to enable use with Windows 98 SE, Windows ME, Windows 2000, and Windows XP. Supports a terminal rate up to 230Kbps. Supports DB9 pins TXD (TD), RXD (RD), RTS, CTS, DTR, DSR, DCD, RI, and GND (SG). Complies with USB specification version 1.1. Limitation: not compatible with mouse with DB9 RS232 connector. Insert the CD in your CD-ROM drive. Connect the USB to RS232 Adapter to one of the USB ports on your computer. Windows XP will detect the new hardware and will automatically install the drivers from the CD. NOTE: If you want to use the USB to RS232 Adapter on any USB port on your computer, then you should repeat the installation process for each USB port. The installation process creates a new COM port. Use Windows' Device Manager to determine which COM port is assigned. Verify that the baud rate, data format are appropriate for your sign. If you have questions, call Alpha-American Programmable Signs at 1-800-223-4636. 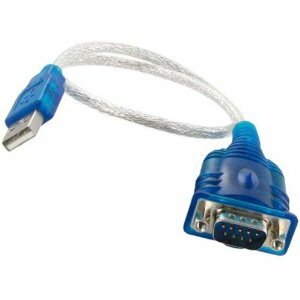 Simply attach the Alpha USB to RS232 Adapter to one of the USB ports on your computer. You may then connect a standard Alpha RS232 sign cable or the RS232 cable for your AMS RS232 to RS485 Converter Box.